At last, a batch of three pairs of gloves, knitted for three of my very good friends. They chose the colours and I really like the way that these sit together. Perhaps it’s because all the yarns are vintage 3ply wools. Each one of them has a small amount of a third or even fourth colour. Two ounces (28grms) is just not quite enough for one pair, usually one finger needs a third colour. All the patterns are those found in Yorkshire gloves, that is, those knitted in Dent, probably by Mary Allen. 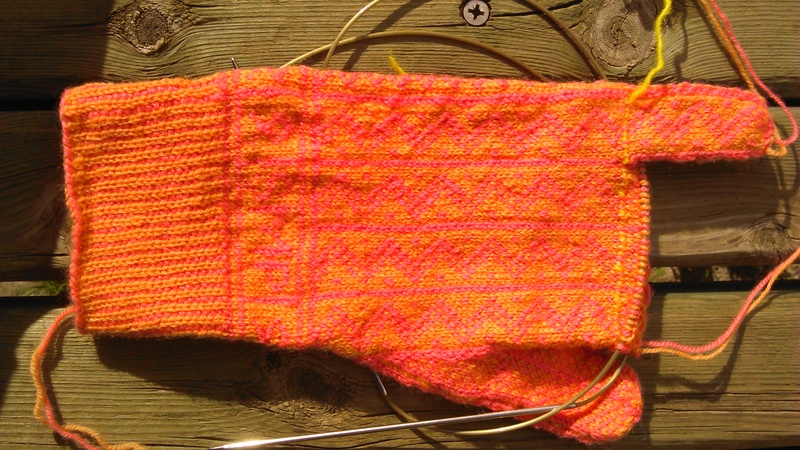 I have finished the pair that I started in about June … the pink and orange pair. I don’t have a photo of them with me and I’m not at home to take one but I thought that I would like to announce their completion. Up until about half way through the year I was knitting a pair a month but I’m behind that now, partly because I don’t know what to do next. I do have a couple of pairs that need to be finished – the other one to the Rowan Fine Lace grey and navy pair, and a Sanquhar Duke pattern one that I am trying to knit to the Patons and Baldwin’s pattern. I’ve got other projects that I would like to make or complete – a sleeveless slipover that I am knitting in black fleck wool and some denim cotton that I would like to knit up into another sleeveless top. There’s also a large basket full of hand spun wools that I plan to crochet into a blanket or throw, but that needs some planning. 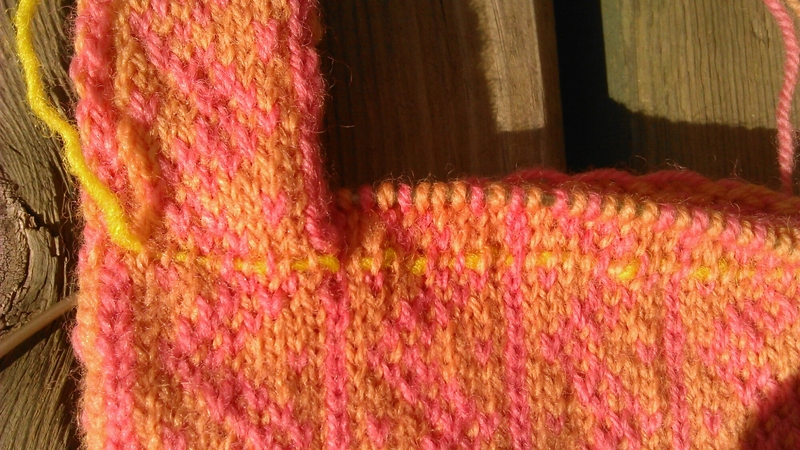 Colours looking great in strong Spanish sun but little actual knitting done. Too much walking and having fun to do. I’ve had chance on trains to London and Paris to get started on the fingers. 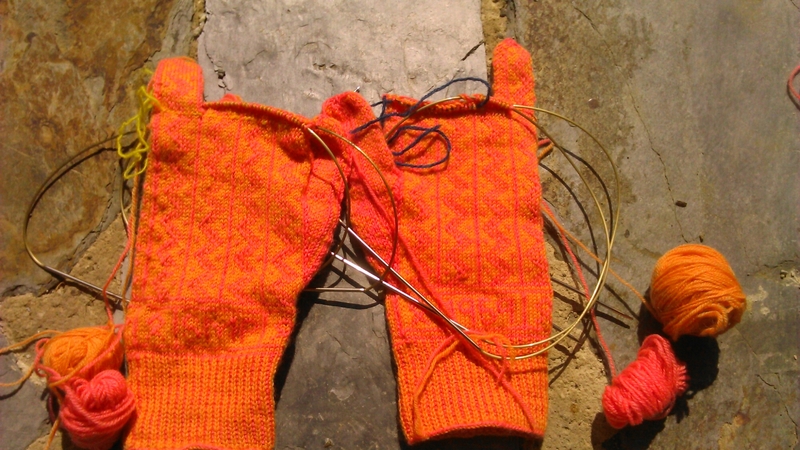 I had decided to knit them in a paler pink and orange but it was too much of a contrast so I’m finishing the original yarn and keeping the pattern going up the fingers too. The 2oth pair – depending on how you count it! I have knitted 4 to the Sanquhar patterns, I from a Mary Allen pattern, 2 inspired by Welsh textiles, 1 in the Tata pattern for 4 ply gloves in a herringbone pattern, 4 for friends, 2 for magazines (1 yet to be published), 3 for a selected exhibition [they weren’t chosen 😦 ], and now another group of three for friends …. each with a Yorkshire pattern on. This pair, the third in the group, is in orange and pink, as requested by the recipient, both colours very close together. The yarns are vintage pure wool 3 plies and they are knitting beautifully on my Addi Turbos, 2.25mm. I’m up to the start of the thumbs and there are initials and a date in there somewhere as well as a simple pattern round the rest of the wrist. One row is k1 alternate colours and the next row is k1 k3 alternately. Small diamonds are produced.